The next-generation, high-throughput satellite (HTS) platform delivers high performance, increased control and all-region coverage – positioning customers for operational and business success. The Intelsat EpicNG platform is an innovative approach to satellite and network architecture utilizing C-, Ku- and Ka-bands, wide beams, spot beams and frequency reuse technology to deliver more throughput per unit of spectrum. 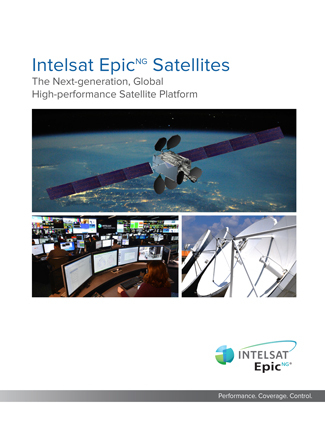 Designed as a complementary overlay, Intelsat EpicNG is fully integrated with Intelsat’s existing satellite fleet and global IntelsatOne® terrestrial network.